Elements of and Bde. completed operation "Koko Head" thus week, bringing the total number of enemy dead to 42. Division soldiers also captured 25 Viet Cong and rounded up 143 Viet Cong suspects during the 14-day, multi-battalion operation in the Ho Bo Woods. The infantry search-and-clear operation was coupled on three occasions with B-52 air strikes and constant support from artillery units at Cu Chi. On Monday, one VC, armed with a .45 caliber sub-machine gun, surrendered, reporting that he had been in Ho Bo Woods in the vicinity of Operation "Koko Head." He indicated that the constant harassment from the air strikes and artillery was affecting the morale and operational effectiveness of the enemy there. The entire operation kept the VC on the run as infantrymen searched the woods destroying one enemy base camp, 208 VC buildings, 152 bunkers, 34 tunnel complexes and several trenches and mortar positions. "Tunnel runners" from 1st Bn. 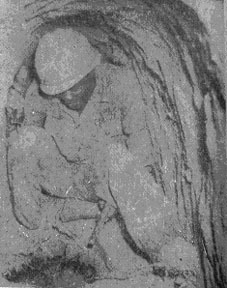 (Mech..), 5th Inf., uncovered and destroyed several three-level tunnel complexes on the operation, some of which had been evacuated shortly before the infantrymen arrived. In one tunnel, hot food was found still on the table. Enemy weapons captured during the operation included 12 carbines, nine rifles, four sub-machine guns and one flare pistol. Also captured were 35,955 rounds of small arms ammunition, 104 grenades, seven M-79 rounds, three 81mm mortar rounds, 27 105mm rounds, one 155mm round, two 250 pound bombs. Miscellaneous medical supplies, documents and clothing, and 2400 pounds of rice also were seized. During the final day of the operation, battalion-sized elements conducting civic action programs near Trung Lap, treated more than 2000 villagers to lunch and a band concert. "Helping Hand" items were distributed to 1,420 villagers, and another 284 were treated through the division's Medical Civic Action Program (MEDCAP). In addition to 1/5th Inf., 1st and 2nd Bns., 27th Inf., were also involved in the sweep. Gen. Harold K. Johnson, Army chief of staff, last week presented the Distinguished Service Cross, the United States' second highest award for valor, to SSgt. John J. McNichol, a reconnaissance sergeant with 1st Bu., 8th Arty. Sgt. McNichol, a Philadelphia, Pa., native, had received the Silver Star Medal; as an earlier, interim award from Gen. William C. Westmoreland, commander, U.S. Military Assistance Command, Vietnam, for action during the division's Operation "Circle Pines." The 49-year-old Sgt. McNichol was with a 1/8th Arty. forward observer team supporting a "Tropic Lightning" company near Trung Lap, about 12 miles north of Cu Chi, on April 5 and the morning of April 6, 1966. When the company was attacked by an estimated Viet Cong battalion, the sergeant was wounded. Ignoring his wounds, Sgt. McNichol repeatedly exposed himself to the intense hostile fire in order to observe and adjust supporting artillery fire. The VC regrouped and launched a second and finally a third assault. Sgt. McNichol, who suffered two additional wounds during the two assaults, refused medical evacuation and continued adjusting accurate artillery fire, inflicting a number of casualties on the VC, and eventually forcing them to withdraw. By this time, he was weak from loss of blood and was going into shock, but before losing consciousness, he told his radio telephone operator how to continue the mission. Sgt. McNichol, now fully recovered, is back with the "Automatic Eighth" Artillery. Gen. Harold K. Johnson, Army chief of staff, visited Cu Chi last week to discuss division problems, give a briefing on Army needs and visit the division's units and facilities. Greeted at Cu Chi Army Airfield by Maj. Gen. Fred C. Weyand, division commander, Gen. Johnson was taken to the Division Ambush Academy for a 20-minute briefing on ambush training by Capt. Malcolm J. Howard, the academy's commandant. They were also given a tactical briefing at 2nd Bde. headquarters. Following the briefing, Gen. Johnson delivered a 15-minute speech to a large crowd of officers and enlisted men at the division amphitheater, where he expressed his satisfaction of and gratitude for the "fine job" being done by the division. The Army chief of staff also visited and talked with members of the 1st Bn., 8th Arty., during his visit. Included in Gen. Johnson's official party were Maj. Gen. Jonathan O. Seaman, commander of II field Force, Vietnam, and Brig. Gen. E. H. Almquist Jr., assistant to the deputy chief of staff for operations. The Tropic Lightning News announces a new "flag," starting in today's issue. The new flag was designed by Sp6 Tatsuo Schwartz of Tokyo, Japan, chief of staff illustrator. It features two division patches and a shiny new Combat Infantryman's Badge. The 2nd Bn., 299th Inf., Hawaii Army National Guard, recently contributed more than $140 to the division's civic action program. A cashier's check, made out to Maj. Gen. Fred C. Weyand, division commander, was received in a letter from Lt. Col. George S. McEldowney, 2/299th commander. Col. McEldowney said the unit volunteered the contributions because of the close ties established between his battalion and units of the 25th, particularly during training periods at Pohakuloa Training area on Hawaii. The 2/299th also made individual donations of clothing and equipment during the division's Operation "Helping Hand." They also helped in collection and transportation during the drive. Of the contribution, Col. McEldowncy said, "Along with it go our utmost respect, aloha and good wishes to all of the officers and men of the 25th Infantry Division." "Space-available is unavailable" is the woeful story of a serviceman's chances these days to hitch a ride aboard Military Airlift Command (MAC) transport planes. MAC officials point out they are booking only those with orders on overseas aircraft and are "over-booking" as well to insure efficiency. Individuals on leave probably will be losing leave time and money by sitting around MAC port-of-embarkation air terminals hoping for non-existent space-available seats. Domestic U. S. A. air-travel for personnel on "combat leave" status going to or from Vietnam is, however, moving thousands of servicemen stranded because of the machinists strike against five major airlines. Capt. Willis A. Blair, Co. C, 1st Bn. (Mech. ), 5th Inf. SFC Robert R. Bode, Co. A, 2nd Bn., 14th Inf. SSgt. Frank D. Wilbanks, Hq & Co. A, 25th Med. Bn. Sp4 John W. Hamm, B Trp., 3rd Sqdn., 4th Cav. Sp4 William R. Mindach, Co. A, 2nd Bn., 14th Inf. PFC Michael Fitzpatrick, Co. C, 2nd Bn., 27th Inf. PFC William D. Gill, Co. A, 2nd Bn., 14th Inf. PFC Richard Madden Jr., Hq & Hq Co., 2nd Bn., 14th Inf. PFC James A. Richardson, Co. A, 2nd Bn., 14th Inf. PFC Luis S. Santiago, Hq & Hq Co., 2nd Bn., 14th Inf. PFC Milton J. S. Seu, Co. A, 4th Bn., 23rd Inf. Lt. Col. Alvin L. O'Neal, Hq & Hq Co., 1st Bn., 27th Inf. Maj. Joseph H. Kastner, Hq & Hq Det., 25th Avn. Bn. Maj. Halvor H. Myrah Jr., Hq & Hq Co., 1st Bn., 27th lnf. Maj. Charles C. Otterstedt, Hq & Co. A, 25th Med. Bn. Capt. Arnold E. Cheal, Hq & Hq Co., 65th Engr. Bn. Capt. Richard E. Holt, Hq & Hq Co., 2nd Bde. Capt. Richard L. Melli, Hq & Hq Co., 25th Inf. Div. Capt. James C. Tanksley, Hq & Hq Btry., Div. Arty. Sgt. Maj. Albert MacDonald, Hq & Hq Co., 2nd Bn., 27th Inf. Sp5 Gerald D. Snyder, Hq & Hq Co., 2nd Bn., 27th Inf. 1st Lt. James E. McQuinn, Co. A, 1st Bn. (Mech. ), 5th Inf. 2nd L. Donald E. Appler, A Trp., 3rd Sgdn., 4th Cav. SSgt. Robert L. Harris, Hg & Hq Co., 4th Bn., 23rd Inf. Sp4 Ismael Figueroa, Co. B, 1st Bn. (Mech. ), 5th Inf. Sp4 Ernie W. Gour, Hg & Hq Co., 2nd Bn., 27th Inf. Sp4 Wayne J. Lange, B Btry., 7th Bn., 11th Arty. Sp4 Robert W. Olsson, Co. A, 1st Bn. (Mech. ), 5th Inf. Sp4 Elisio R. Rodriguez, B Trp., 3rd Sqdn., 4th Cav. Sp4 Kenneth H. Sage, Co. C, 4th. Bn., 9th Inf. PFC James E. Wine, Co. B, 1st Bn. (Mech. ), 5th Inf. 1st Lt. Lewis L. Barger Jr., D Trp., 3rd Sqdn., 4th Cav. 1st Lt. Carl W. Burns, D Trp., 3rd Sqdn., 4th Cav. 1st Lt. Rodney L. Lutes, Co. B, 4th Bn., 23rd Inf. 2nd Lt. Dale R. Crafton, Co. B, 2nd Bn., 14th inf. 1st Sgt. Harold P. Powers, Co. B, 4th Bn., 23rd Inf. PSgt., Mamoru Arashiro, Co. B, 4th Bn., 23rd inf. SFC Ray D. Lynch, C Btry., 1st Bn. 8th Arty. PSgt. David C. Nelson. Co. B, 4th Bn., 23rd inf. Sgt. Robert M. Cunningham, Co. B, 4th Bn., 23rd Inf. Sgt. James S. Mackaye, B Btry., 7th Bn., 11th Arty. Sgt. Sipunu McMoore Jr., A Trp., 3rd Sqdn., 4th Cav. Sgt. Alberto T. Rodriguez, Co. B, 1st Bn., 27th Inf. Sgt. David C. Springer, Co. B, 2nd Bn., 14th Inf. Sp5 Dennis S. Oriman, Hq & Hq Co, 2nd Bn., 27th Inf. Cpl. Joseph G. Boyd, B Btry., 1st Bn., 8th Arty. In little more than five years the Viet Cong armed forces have grown from an essentially guerrilla army to one that includes regiments of uniformed, well-equipped, highly foot-mobile regulars capable of engaging in conventional operations of limited duration. Concurrently, their civil organization has grown from a mere shadow to one of considerable substance which in some provinces collects almost four times as much taxes as does the Republic of South Vietnam. The Communist Party, under its cover name of the People's Revolutionary Party, has expanded the control it exercises on behalf of North Vietnam - the so-called Democratic Republic of Vietnam. Substantial quantities of portable war materials have been brought into South Vietnam by land and sea, as well as 8,000 to 10,000 North Vietnamese soldiers in the year 1954 alone. The Communist buildup in the south is continuing. As Viet Cong resources and capabilities have grown, so have their liabilities. They have been forced to draft teenagers directly into their regular units. Logistics requirements for food and weapons have greatly increased. Even regular units spent much of their time in producing their own food until 1964, a practice which increased air surveillance may render unprofitable. Most significant, and most dangerous for both sides, the Viet Cong pretense of being truly a South Vietnam "people's army" is rapidly being destroyed by the introduction on a growing scale of North Vietnamese forces and equipment - and by their own stepped-up actions as well. If this effort to achieve a quick victory fails, as our increasing support of the free Vietnamese is intended to assure, they say they are quite prepared to continue for 10 or 20 years if necessary and possible. The war in Vietnam "is a different kind of war" said President Johnson on July 28, 1965. "There are no marching armies or solemn declarations. Some citizens of South Vietnam, at times with understandable grievances, have joined in the attack on their own government. But we must not let this mask the central fact that this is really war. It is guided by North Vietnam and it is spurred by Communist China. Its goal is to conquer the south, to defeat American power and to extend the Asiatic dominion of communism." Cur military effort in Vietnam is an essential element in achieving the objectives of freedom, peace and progress in this war-torn country which has fought so long and valiantly for those goals. Uncle Sam has a problem. It concerns his "balance-of-payments deficit." This is not a new problem as problems go. As a matter of fact it has been plaguing him for a number of years - since 1957 to be exact. But what is this "balance-of-payments deficit"? Where does a serviceman fit the picture? We'll take the latter first. Simply, Uncle Sam wants his favorite nephews to buy American products. Buy Savings Bonds. Keep his dollars in American channels. Not a hard thing to do, really. Now, the reason of his suggesting you do this? Basically, the "balance-of-payments" deficit is nothing more than a record of all financial transactions taking place between Uncle Sam and the rest of the world. It covers receipts and payments for both private and governmental transactions, whether settled in cash or financed by credit. Here's an example: In 1964 we paid out to foreign countries $40.7 billion and received from them $37.6 billion. So, in that year, we had a balance-of-payments deficit of $3.1 billion. Our military expenditures abroad that year totaled a net $2 billion. It doesn't require a genius to understand that Uncle Sam's bankbook will not balance. Yours wouldn't either. All right, what must be done about it? First Uncle Sam must eliminate the deficit in his balance-of-payments account by increasing U.S. receipts from abroad. Second, he must reduce the outflow of dollars to foreign countries without sacrificing other national policies. That's where you come in. You can help reduce the outflow of dollars by purchasing American-made products. You can help by participating in the Payroll Savings Plan. The TROPIC LIGHTNING NEWS is an authorized publication of the 25th Infantry Division. It is published weekly for all division units in the Republic of Vietnam by the Information Office, 25th Infantry Division, APO U.S. Forces 96225. Army News Features, Army Photo Features and Armed Forces Press Service material are used. Views and opinions expressed are not necessarily those of the Department of the Army. Printed in Saigon, Vietnam, by Saigon Daily News. 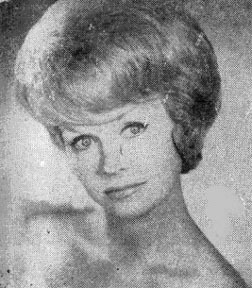 Sue Thompson, popular vocalist who sang such hits as "Sad Movies" and "Norman," will entertain at Cu Chi on August 17 during two shows at the Division Amphitheater. The blonde singer will top off a 17-day tour of Vietnam Sponsored by United Services Organization (USO) with a Performance at 10:30 a.m., and another at 2:30 p.m. Appearing with Miss Thompson will be the musical trio "The Wild Affair," featuring Rod Birmingham on lead guitar, Denny Martin on bass guitar and Chuck Morgan playing the drums. The three young Californians have become one of the hottest groups in the United States. Miss Thompson has recently been making night club appearances in the Las Vegas - Reno area and has also been performing at USO shows because she says, "I love singing for the fellows in the service. They deserve a good performance and they're the best possible audience." The five-foot one-inch star arrived in Vietnam on August 5 and will leave August 19. Members of 3rd Bn., 13th Arty., call Sgt. Blake E. Smith "The Gunner" - a nickname he has earned during three hitches in the Republic of Vietnam. In May 1961, while in Hawaii, Sgt. 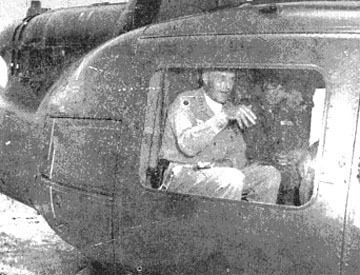 Smith volunteered for duty as a "shotgunner" on a UH-B helicopter. He served three months here, earning the Purple Heart and the Army Commendation Medal (ACM). "Our chopper took seven rounds the first time I was wounded," remembered the artilleryman from Freeport, Tex. "We were able to keep the ship in the air, but I came out with a piece of metal in my arm." Sgt. Smith earned the ACM during 17 days of duty over Danang, helping lift Vietnamese from villages threatened by the Viet Cong and taking them to new locations." "I couldn't sit on the sidelines," He said, "so I volunteered for another shotgun tour in September of 1965." During the tour, Sgt. 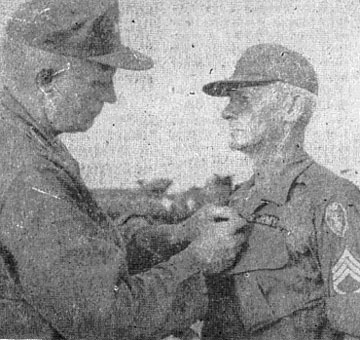 Smith received the Vietnamese Cross of Gallantry for his participation in an air mobile assault on Don Xoai. While flying at 150, feet, his helicopter was hit in the hydraulic system. Losing hydraulic pressure, the chopper's power was cut and the pilot was able to "crash land" the aircraft upright. After the second tour, Sgt. Smith was awarded the Air Medal with 11th Oak Leaf Cluster, signifying 300 combat hours in the air. He came to Vietnam again in March of this year when the 3/13th moved from Hawaii. A few months ago, during an operation at Trung Lap, the 20-year-old soldier was wounded a second time when his battery's command post was mortared. But he is still riding gunner. He has merely switched his perch in a helicopter for a berth atop a 155mm self propelled howitzer. One of the smallest sections in the division - the quality control section of Co. E, 725th Maint. Bn. - is harnessed with one of its biggest jobs - that of supervising the care of division aircraft. Staffed by two test pilots and four technical inspectors, the section has about 80 choppers under its control, occasionally with as many as 35 "sick birds" on hand in one day. When an aircraft needing maintenance enters E Co. repair shops, the section's technical inspectors begin a long session of individual attention. Screening the copter against its past record of repairs, the. inspectors conduct an initial inspection to uncover any faults not listed on a work order. At the completion of the initial inspection, the aircraft is turned over to a maintenance team for completion of the work required. Throughout the repairs, the inspectors conduct spot checks to supervise the aircraft's progress. After repairs are completed, another inspection is conducted and records are brought up to date before the aircraft is turned over to one of the section's test pilots. Following another check by the pilot, the chopper is put through its paces and inspected again to find any faults that developed during testing. If the aircraft passes, it is sent back to its unit. For aircraft downed in the field and unable to be brought to the Co. F repair shops, the section is equipped with two UH-1B helicopters, and a standby maintenance recovery team. A small operations branch maintained by the section monitors air-to-ground communication to plot the position of the downed aircraft and to send members of the standby team on their way. "Although small, the quality control section has a large responsibility," said Capt. Robert S. Tamer, F Co. commander. "The members of the section work together to produce a maintenance team's most important product - safety." Recently the reconnaissance platoon from 4th Bn., 9th Arty., set an ambush outside the field camp perimeter at Gia Ray, a squall village about 90 miles northeast of Saigon. They were prepared for a long night of waiting - hoping to catch "Charlie" unaware. The wind died and the pounding rain, which soaked them on the march out, slowed to a light drizzle. Away from the generators and activity of the camp, all was quiet. After waiting about an hour in the unbroken silence, Sp4 Thomas Nesbitt of Marion, Ind., the platoon medic, heard the ominous crack of a carelessly placed step breaking a twig. Crouched low to the group, Nesbitt readied his M-16 with one hand and signaled the man next to him with the other. Soon the whole platoon was waiting for the expected view of the enemy. All weapons were ready to open up and spray the area with automatic fire and M-79 grenades. Just as Nesbitt started to close on the trigger, a big boar poked his snout into the open about ten feet away. The pig looked quite vicious but was easily routed and the platoon sat back again to wait for "Charlie". Score at file end of one hour of waiting: 1 grunt, 1 peeved hog, nobody left on. "What's a chicken doing on an eight-inch howitzer?" "I don't know. It must be a gun birdie." Gertrude, the watch hen of D Btry., 3rd Bn., 13th Arty., is hardly "chicken" when it comes to supervising a nighttime fire mission. In fact, she doesn't even move from her perch aboard the gun when it is being fired. Gertrude usually turns in at twilight. A quick flutter of wings and she is settled for the night on a steel rod behind the projectile chamber of the last howitzer on the battery's firing line. PFC John J. Waga of Central Islip, N.Y., a member of the howitzer crew, is Gertrude's "sponsor" and, until a certain rooster left for other parts, traded bread, pancakes and scraps for Gertrude's eggs. Now that she isn't nesting anymore, Waga is caught in a won-way deal. He doesn't mind; he and his friends have gotten to like the courageous chicken. One time Gertrude had the nerve to walk right into the cavernous muzzle of the gun. A fire mission was called to the battery just as Gertrude began spelunking. Someone had to catch her or it would have been creamed chicken. A long arm pulled out the indignant hen, who considers the gun her boudoir. It seems as if the only thing that will drive Gertrude from her favorite perch, aside from brute force, is a heavy rain. Even then she stays aboard the weapon, sleeping on top of the tracks, underneath an overhanging steel floor. It remains to be seen whether Gertrude will accompany the battery into the field. But no matter, for she has proved that shi is not chicken. LAST VISIT - Division soldiers form up outside the headquarters building at the Cu Chi base camp for a special color ceremony in honor of Gen. John K. Waters, commander-in-chief, U.S. Army, Pacific. It was Gen. 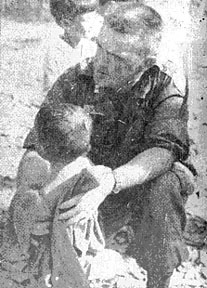 Waters' last visit to Cu Chi. ARRIVAL - Gen. Waters lands at the Cu Chi Airstrip for his farewell tour. 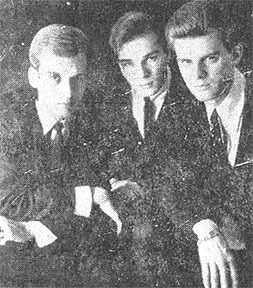 TOUR - Gen. 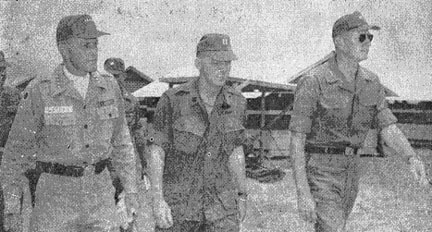 Waters is escorted by Maj. Gen. Fred C. Weyand, division commander, and Capt. Malcolm J. Howard, Ambush Academy commandant, to the division's Ambush Academy. FIGURES - Lt. Col. Robert R. Hicks, division civil affairs officer. Gen. Waters, "In one week alone, we have assisted 1,753 persons under Operation "Helping Hand," thanks to people of Hawaii." 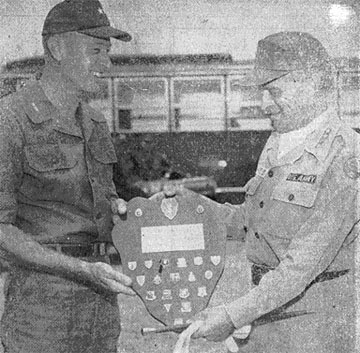 SPECIAL - Maj. Gen. Fred C. Weyand presents a special plaque with all the crests from the division's units to retiring Gen. John K. Waters during his farewell visit to the Cu Chi base camp. AMBUSH ROAD - Capt. 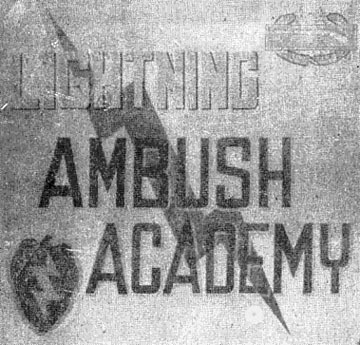 Malcolm J. Howard, Ambush Academy commandant, points out the training facilities to Gen. Waters. They are designed to teach the latest techniques of ambush. With Gen. Waters is Maj. Gen. Weyand. This 1966 general election year will see one-third of the U.S. Senate, all of the House of Representatives and a number of local officials across the nation elected or re-elected to public office. The following table is a list of primary elections scheduled during the month of September, including the date of the election and the officials who will be nominated. Most states permit voting in primary elections by absentee ballot although there are several which limit voting to primary elections. For more detailed information concerning qualifications on voting by absentee, see your unit voting officer or consult DA Pamphlet 360-503, "Voting Information 1966" which contains detailed information about the procedures involved in applying for and voting by absentee ballot. To nominate: U.S. representatives, governor, secretary of state, attorney general, treasurer, auditor, state mine inspector, two supreme court judges, one corporate commissioner, superior court judges, clerks of superior court, one tax commissioner and some justices of the peace and constables. Ballots must be in by 6 p.m. on the day of election. To nominate: U.S. senator, U.S. representatives, three state supreme court judges, governor, lieutenant governor, secretary of state, state treasurer, attorney general, two members of the State Board of Education, 14 state senators, 65 state representatives, two district judges and two regents of the University of Colorado. Voted ballots must reach election officials before the closing of the polls on election day. To nominate: U.S. senator, U.S. representatives, governor, lieutenant governor, secretary of state, attorney general, state school superintendent, comptroller general, treasurer, commissioner of agriculture, commissioner of labor, general assembly members, judges and solicitors general and certain county officials. Ballots must be voted and reach voting officials before the closing of the polls on election day. To nominate : U.S. senators, U.S. representatives, governor, lieutenant governor, secretary of state, state auditor, treasurer, secretary of agriculture, 47 state senators, 124 state representatives and also local officials. Ballots must be in before the day of election. To nominate: U. S. representatives, governor, comptroller, attorney general, state senators and state representatives. Ballots must reach election officials by the closing of the polls on election day. To nominate: U.S. senators, U.S. representatives, railroad and warehouse commissioner, two state supreme court justices, district judges, state senators, members of the house of representatives, some county officers and municipal officials. Ballots must be in before the closing of the polls on election day. The balloon went up 16 miles northwest of Cu Chi recently. On the ground watching it were four members of Div. Arty. 's Ballistic Meteorology Section. The balloon, paired with a tracking device resembling a surveyor's transit, was being used to determine wind speed and direction for 3/13th Arty. weapons digging in near Go Dau Ha. "Many people think that artillery operators just aim and shoot when they're assigned a target," said Sp5 Ralph E. Craiger, the section's team chief. "Actually, aiming in at a target is an involved process because of allowances that must be made for wind speed and direction." To make those allowances, Specialist Craiger and his men send a three-foot balloon aloft every six hours and watch its course with a telescopic instrument called a theodolite. Scales on the theodolite give direction and elevation readings when the balloon is centered on the instrument's cross hairs. "A table converts elevation readings into horizontal distance," explained the specialist, "and we plot out the balloon's course and time on charts to get ballistic speed and direction. The distance the balloon travels divided by the time it took to travel that distance gives us the wind speed." In addition to geometric technicalities, each balloon must conform to a set weight for standard rising speed, with allowances made for a small light used for nighttime tracking. Air temperature and density also figure into the final statistics. When all has been plotted and computed, the team turns its figures over to the unit's fire direction center, which converts them to actual aiming corrections. "It's all really very simple," said Specialist Craiger as he began to plot another reading. Donald Duck and 25 of his friends are lending a hand to the 2nd Bn., 27th Inf., as a living, waddling "Cong alarm." It began when the "Wolfhounds" began looking for a way to strengthen their perimeter defense while in the field. They wanted an alarm system that would let them know if the Viet Cong tried to sneak through the 2/27th lines. One idea that came up and promptly went down again - was the use of tin cans strung on a wire. No good, was the verdict, because the VC move so carefully that they would no doubt discover the wire and noiselessly cut it. The two most logical men to make the purchases were 1st Lts. Larry Witten, the battalion civil affairs officer, and Hector E. Sorrentini, the assistant battalion intelligence officer. And after the lieutenants had bought them, they were also given the job of testing the ducks to make sure they would sound the alarm if anyone came near. Of the original 30, Lt. Sorrentini found four quackless quackers. Quackers separated from non-quackers, the 26 which had passed their auditions were placed tenderly on a helicopter and flown to the battalion field command post. From there it was just a short distance to the feathered things' guard posts around the camp, tied on four-foot-long tethers. While many insist that a dog is man's best friend, there are at least a few Wolfhounds who are being very kind to their web-footed friends. Vietcong monsoon operations are being spoiled by continuing allied ground attacks and constant air strikes on supply lines and guerrilla strongholds. U.S. officials point out that American ground forces have staged 20 successful ground operations since April 1 involving multi-battalion strength. They also cite a total of 3300 battalion-size or greater operations by Republic of Vietnam ground forces since January 1. Many men of the 25th have had a close brush with death and are still here to tell about it but few as close as Sp4 Troy O. Brown of Knoxville, Tenn.
Brown, assigned to the 4th Bn., 9th Inf., had his close call during Operation "Kahana" in the area of Gia Ray. During a Viet Cong ambush, an armor-piercing round hit a hand grenade attached to Brown's ammo pouch. The round penetrated the outer core of the grenade, glanced off and entered the ammo pouch, which contained two full rifle magazines. Amazingly, there was no explosion, but the shell hitting the grenade was enough to knock Brown to the ground. Removal of his equipment revealed that the only damage from the incident was a welt on his hip. Brown was presented the disarmed grenade" as a souvenir in remembrance of his close call in Vietnam. Someone suggested he didn't really need any reminder. It seems like a month since I've been out with the troops on an operation, and I guess it has. I picked the 1st Bn., (Mech. 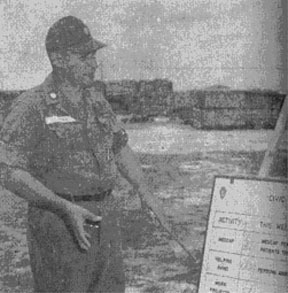 ), 5th Inf., because of their unusual mission" "post-bomb damage assessment" for a B-52 strike in the Filhol Plantation and, naturally, "search and destroy." Lt. George Smith, the Co. A executive officer from New Orleans, greeted me at 7 a. m. in the motor pool and said I could ride in his track. It doesn't take long to get ready. Off comes the fatigue shirt, and on goes the flak jacket. The soft cap is hung on the fire extinguisher and the helmet settles heavily. The Filhol Plantation trip is a fast one. The first armored personnel carrier (APC) starts a follow-the-leader, zig-zag route right out of the Standing Orders, Rogers Rangers. There, in front of us, is the reason we came: a ten-foot deep crater. The fresh dirt piled around it is blackened by the blast. All vegetation is gone. Further out from the center, only the stumps of what had been 8-inch-thick trees remain, their tops neatly severed by the saw-like fragments of the big bombs. The company flanks into the path the big bombers followed. The huge pock marks are everywhere. There was no warning when the APC on our right hit a mine - only the explosion, the flying debris, and dirt. The men, well trained, evacuated the machine and set up a security perimeter around it, searching for the possible enemy that touched the wires together to detonate the mine. The wounded are evacuated to the medical APC that follows the formation. "They're shaken up," comes the report from the medic, "but nothing serious." The squad had located the bunker that the mines were protecting, and a concentration of automatic weapons fire from the "Bobcats" made the bunker a very unpopular place to be. As quickly as it started the firing stopped and the mechanized troopers, now on foot, approached the entrance. A call for the "tunnel runners" went out, and first reports told the story. Behind the mines was a long, seven-foot-deep trench with escape tunnels leading to the bunker. The big room of the bunker was directly under a hastily erected lean-to. Well-carved steps led down to the rooms that had sleeping niches cut into the sides. Lt. Ronald W. Sergeant was one of the first "Bobcat" into the hole. "Believe me," he said, "I don't particularly enjoy this tunnel business. But it is one of the times when the 'Follow me' attitude pays off. It's Charlie's country down there and it's a good feeling to know you've got friends with you." Lt. Sergeant is more than six feet tall, and with his broad shoulders he is the least likely candidate to lead the runners. Charlie is down there somewhere and we want to find him," he says, the only reason he gives for his additional duty. Fifteen feet below, the three-foot-high tunnels lead away from the main room. These must be searched, the ceilings, floors and walls probed. Behind a false wall, two sub-machine guns and their ammunition are found. Here also are the documents, a Viet Cong platoon leader's notebook, propaganda leaflets and the accouterments of just living underground. The company has an objective to take, so the tunnel runners, demolition experts and the track recovery specialists stay to clean up their unfinished business. Once the objective is reached, the jets and artillery rounds whistling overhead set the tune for the noon meal. C-rations are as good as ever. The two national policemen who have quietly ridden with us now bound out of the APC in search of food to supplement the "C's." One brings back two green citrus fruits that he calls "buoi." After cutting through two layers of peeling, he offers me a segment of the fruit. It has the grapefruit taste but lacks the abundance of juice. Lt. Smith, chewing on one of the sections, comments, "You wouldn't believe some of the things these policemen find to eat. I guess our C-rations are a little rich for them." There's always another objective and off go the tracks winding through the symmetry of the rubber trees. That's the life of the Mech. - 99 per cent searching and clearing and one per cent bone-shattering action. A man works from sun to sun but a woman's work is never done, especially the work of a woman who is a housewife by day and a Viet Cong sniper by night. The discovery of another sweet sniper was made by the 2nd Bn., 27th Inf., while on an operation southwest of Cu Chi. Two captured Viet Cong led the "Wolfhounds" to a bunker, a resting spot for the woman and her squad, they said. They also claimed she was the best sniper working in the Cu Chi area. The battalion didn't find "Madame X" but is hot on her trail. With the information they now have the Wolfhounds will not only be looking for arms and ammunition but for a sweet-smelling VC with long hair. Four maintenance men from 125th Sig. Bn. scored an electronic coup recently by developing an air-transportable very high frequency (VHF) radio system for their unit's use in the field. Learning of an operation in which the battalion was to be transported by air, SSgts. Theodore Moore and Charles Bunger and Sp5s Thomas L. Baines and Frank V. Monroe, all of the signal battalion maintenance section began a three-day, around-the-clock project of cutting down the size of an AN/MRC-69 VHF radio set. The set, which ordinarily occupies a 2 ½-ton truck and a 1 ½-trailer, had to be squeezed into a ¾-ton vehicle with trailer, before it could be airlifted by a "Chinook" helicopter. To modify the radio, the signalmen pulled out essential parts, rewired them for a smaller power source and installed them in the 3/4-ton truck. The solder had hardly cooled before the compact instrument was lifted to its field location where the battalion used it to send fire requests, intelligence data, combat support and resupply requests back to Cu Chi. Although the small set, termed the AN/MRC-34.5 by the battalion, uses four telephone channels instead of the usual 12, its operation was termed "very successful" at the end of the mission. Two more modified sets have been added to the battalion and more are planned as they are needed. 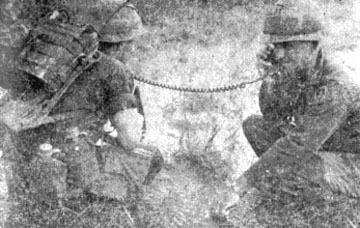 COMMUNICATIONS - Lt. Col. Boyd T. Bashore, commanding officer, 2nd Bn., 27th Inf., directs "Wolfhound" maneuvers by telephone during a recent operation not far from Cu Chi. While few soldiers are about to claim that C-rations are the worst form of nourishment ever invented by man, it is safe to say that a steady diet can get old fast. Squad members from Co. A, 4th Bn., 9th Inf., got a slight change in diet recently thanks to PFC. Marshall H. Ayers of Jackson, Miss., who did nothing more than put his big foot in it. Ayers, the point ran on the patrol, lowered the foot, saw a snake staring him in the face, jumped back, fired three shots with his M-16 and the snake was KIA. PFC Patrick McDermott of Bronx, N.Y, wasting little time, finished the job by cutting off the snake's head. Then the real work began. PFC Harry A. Hitchcock of Milford, Conn., skinned the snake while the others collected salt from C-rations and salt tablets to treat the hide. McDermott later fashioned a wallet from the hide. An impromptu rotisserie-type grill was built, a large hunk of snake meat thrown on, and the men chowed down. Not one complaint was recorded. A Viet Cong training camp, consisting of eight bunkers and a small grenade factory was uncovered and destroyed by the reconnaissance platoon of 1st Bn. (Mech. ), 5th Inf. The action occurred during a recent operation eight miles north of Trung Lap. Led by 1st Lt. James E. McQuin, of Indianapolis, the platoon discovered the site while on a reconnaissance mission. Engineers working with the infantrymen detonated an estimated 160 pounds of cratering charges, 50 pounds of dynamite and 40 pounds of plastic explosives in the destruction of the camp. In addition to 40 pounds of lead and miscellaneous grenade parts found in the bunkers, the platoon captured 500 pounds of polished rice and boxes of medical supplies, clothing and documents. A battalion-sized element from 2nd Bde., operating in the Viet Cong-infested Ho Bo Woods 30 miles northwest of Saigon, came under heavy mortar and automatic weapons fire on Operation "Koko Head" last week. Artillery barrages called in from the division base camp silenced the mortars, while the surviving VC melted into the jungle. As one company prepared to make an assessment of damage from B-52 bomber strikes, a hail of 60mm mortars and rifle grenades fell in their midst. 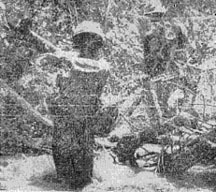 Artillery was quickly called in again and the company fell back to the vicinity of the battalion command post located in an abandoned rubber plantation. As a "Dustoff" helicopter settled to the ground, medics placed the few casualties on board and moved back to allow the aircraft to lift off. The VC, aiming at the chopper, struck again with another mortar and grenade attack. Once the second artillery barrage and the tactical air strikes ceased, the companies again started moving and the entire area seemed to he crisscrossed with VC trenches over four-feet deep. The going was slow because each of 17 bunkers and structures had to be searched and destroyed. Later assessment revealed that, in addition to fortifications destroyed by ground units, seven multi-storied bunkers were demolished by artillery and air strikes. Lt. Col. Victor F. Diaz has assumed command of 1st Bn., (Mech. 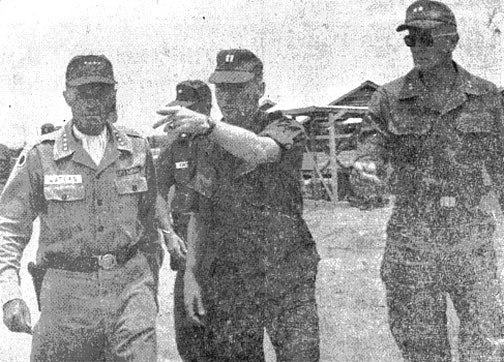 ), 5th Inf., in ceremonies at Cu Chi. Col. Diaz received the battalion colors from Lt. Col. Thomas U. Greer, former battalion commander. Col. Diaz also received the battalion crest from Col. Greer and Maj. Gen. Fred C. Weyand, division commander. Col. Diaz is a graduate of the Infantry Officer Candidate School and the Infantry Officers Advanced Course at Ft. Benning, Ga., and the Command and General Staff College at Ft. Leavenworth, Kan.
A veteran of World War II and the Korean Conflict, he was awarded the Distinguished Service Cross while serving with the 19th Infantry. Col. Diaz, who has been on active duty for 24 years, is in his seventh overseas tour, the fourth in the Far East and the second in Vietnam. He formerly served as advisor to the 5th Military Region at Can Tho. Col. Greer, who has assumed duties as division G-3, was graduated from the U.S. Military Academy. He later received his Masters Degree in Engineering from the University of Illinois. The 39-year-old colonel has been awarded the Bronze Star and the Silver Star Medals for gallantry in action while serving in Vietnam. He joined the division in August 1965, after serving with the operations branch at U.S. Army, Pacific, to assume command of 1/5th. Btry. C, 3rd Bn., 13th Arty., ("The Clan") moved to a Popular Forces camp at Go Dau Ha, 16 miles northwest of Cu Chi. The unit's 155mm howitzers will support both U.S. and Army, Republic of Vietnam (ARVN), operations and convoys in the area. The new camp, which has been used only for brief periods during the past three years, is to serve as a semi-permanent base camp for the "Clansmen." Under the command of Capt. Ronald R. Devitt of Lake City, Iowa, the men have begun building permanent bunkers, filling trenches, and making general living improvements. Vietnamese laborers have been hired to help with the reconditioning of the camp, and plans are being made for the 3/13th battalion surgeon to bring a medical team to the area. Elements of Hq. Btry., Div. Arty., D. Btry., 3/13th Arty., and 125th Sig. Bn., are supporting the Go Dau Ha operation. A fund, supported by contributions from division members, has been established to aid the families of Vietnamese National Policemen killed or wounded in action while serving on operations with the division. Contributions, solicited on payday, are being given to the families by a committee composed of the division's civil affairs officer (G-5), intelligence officer (G-2) and the division sergeant major. The money will be used to pay for burial expenses, to re-locate families, and to cover other expenses caused by the death or disability of the policeman. The idea for the fund came from members of 1st Bn., 25th Inf. Their initial appeal resulted in contributions of $455. National Policemen serve as interpreters and interrogators while on operations with division units.